Subject: RE. EURO CLAIM CENTRE S.L (CLAIM PROCEDURE)!!! "HOW DID YOU WIN??? HOW DID THEY GET MY EMAIL ADDRESS???" Most recently the foundation set up the NEW HOPE LOTTERY to give out prizes, the selection process was carried out through a random selection in our computerized email selection system from a database of over 1,000,000 email addresses drawn from all the continents of the world, (THEREFORE YOU DO NOT NEED TO BUY A TICKET TO ENTER FOR IT ). Your email address was randomly selected as one of the (4) international lucky star winner in the email lottery programme, in the 2 class of the category draws. You have been therefore approved a lump sumof (Seven hundred and eight thousand, five hundred and ninety-three euros, thirty-three cents only) 708.593,33 Euros. However,we as the fudiciary claim agent in this promotion is to process and also effect the transfer of your winning funds to your nominated account or to you in the mode of payment choosen by you as the true and bonafide winner in this promotion. 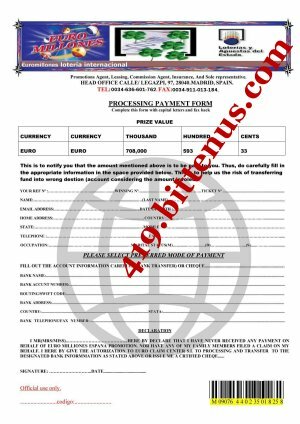 The processing payment form sent to you below (via email attachment) needs to be filled out and send back to the Euro Claim Centre, S.L. via scanned email attachment or by fax (0034-911-013-184) with a copy of your identity (international passport/ drivers license) AND INDICATE YOUR E-MAIL ADDRESS THAT WON YOU THIS PRIZE, for the processing of your winning prize to commence and be transferred. Your winning prize is now deposited on your file reference number in a suspense account in your favour, waiting for the immediate remittance to you by the paying bank. Be informed that yourwinning Prize is not DEDUCTABLE until finally credited to your designated account or issue you a cheque. The processing of your prize will be completed within three (3) working days and subsequently you will receive your prize money. You are to call ( MR. ADAMS FERNANDO) your claim agent officer on TEL: 0034-636-601-762, as soon as you send the processing payment form with a copy of your identity, so as he can inform you on the next step of procedure with further instructions and subsequent release of your fund as due to mix up, we do not want to pay money into wrong accounts. Once again we advise you to keep your winning information strictly confidential to avoid double claims, until your winning prize has been fully transfer/remitted to your nominated bank account OR issue youa Cheque; this is to avoid double claim and unwarranted abuse of the programme by some participants.